This plan of north east London extends from the Isle of Dogs and Wapping at the bottom, to 'Layton Stone' and Epping Forest at the top. Field boundaries infilled with stripes depict tilled land. Major settlements are drawn in red ink. North of Stoke Newington, to the top left, a road is plotted as a series of fixed points pricked off with dividers and joined by ruled pencil lines. These protractions were made directly from the Ordnance Survey field books. Pencil rays intersect across the map, evidence of measurements taken by the surveyor between fixed triangulation points. 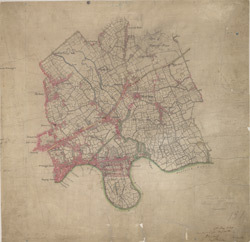 Poplar Gut is outlined in red at the Isle of Dogs, the beginnings of the development of the West India Docks.